The 51st legislature of the Student Government Association (SGA) passed bills on Monday night that amend the Code of Elections by allowing a “No Confidence” option in contested races and clarifying registration requirements for candidates. A bill that calls for anonymity during electoral misconduct investigations was tabled. The bills stemmed from issues raised during the Spring 2018 student government election cycle. Additionally, SGA approved the administrative budget for the 52nd legislature and the 2018-2019 Executive Agency (EA) budgets. The legislature unanimously passed with 10 votes Bill 51sl63, submitted by the Oxford SGA, which calls for a “No Confidence” option on elections ballots and aims to provide students with “the opportunity to voice dissent against all candidates running.” Previously, the ballot only offered a “No Confidence” option in races where candidates were running uncontested. SGA Speaker of the Legislature and Senior Representative William Palmer (18C) stated that the bill needed to be amended to provide a formal change to the Code of Elections that would allow a “No Confidence” option for all elections ballots. Freshman Representative Austin Graham (21C) initiated an amendment to the bill that would remove the phrase “where candidates are uncontested” from Part III, Article 2, Section F of the Code of Elections. The amendment passed unanimously with 10 votes, as did the bill. SGA President Gurbani Singh (18B) noted that the next legislature needs to codify what would happen if “No Confidence” receives the majority of votes and whether a candidate who loses to “No Confidence” could run again in a run-off election. Bill 51sl64, submitted by the Oxford SGA, passed with nine voting in favor and one abstaining. It prohibits late registration for candidates unless the Elections Board “finds an internal error,” according to the bill. If candidate registration is extended, the bill calls for the extension to take place publicly and in a “timely” manner. Originally, the bill had stated that if there is a reason for the Elections Board to extend the deadline, then the deadline must be extended for all eligible students. Graham called for the bill to amend Part IV, Article 2 of the Code of Elections and replace the rule that a candidate only has 12 hours after the Elections Board’s final interest meeting for potential candidates to petition for candidacy. The bill amendment states that a list of successfully registered candidates should be released to the student body after the registration period concludes. Any student who is not listed as a successfully registered candidate has 24 hours to submit a petition to the Elections Board and potentially be added to the list. 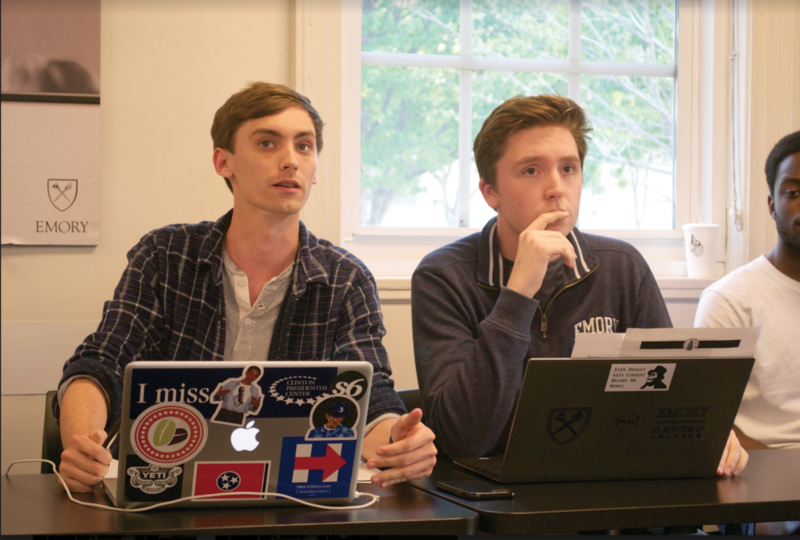 Oxford SGA President Ben Palmer (18Ox, 20B) said the use of OrgSync to register candidates would solve the issue of candidates not knowing whether they have officially and successfully registered for the election. For the past two years, the Elections Board has used Google Forms for candidate declaration. The Elections Board heard cases this elections season regarding four late declarers: Mario Karras (17Ox, 19B), Radhika Kadakia (20C), Karen Lee (21C) and Sania Chandrani (19B). “I do think if we moved it straight to OrgSync [for candidate declarations], that platform would … solve the [problem with] notifications because as soon as the Elections Board says ‘Yes, you are an approved candidate,’ they get an email receipt that says so,” Ben Palmer said. William Palmer said that, by using OrgSync to register candidates, there would be no way of knowing which students had registered properly. The amendment passed unanimously with 10 votes. Chair of the Elections Board Betty Zhang (20C), who told the Wheel she planned to resign on Tuesday night, asked if the bill would give the Elections Board power to decide what constitutes an “internal error.” Ben Palmer said the bill was left intentionally vague in order to leave it up to the interpretation of the Elections Board. Zhang said she did interpret each case brought to the Board during the election cycle differently. “I did it on a case-by-case basis, so that this candidate had a case of technological error and the next candidate [had] a case of a completely different error, and that proved to be problematic because people started challenging the basis of which I decided,” Zhang said. William Palmer said students should have the ability to challenge the Elections Board. Graham said he didn’t agree with the bill’s vagueness and recommended that the 52nd legislature codify what an “internal error” means. Ben Palmer said that any biases would be nullified because the bill would extend the registration to all candidates. William Palmer said he believes that allowing an extension for everyone is “too forgiving” and should be removed from the text of the bill. Graham offered an amendment to the bill that would remove the deadline extension offered to all candidates. The amendment passed with nine votes in favor and one abstaining. Bill 51sl65, submitted by Oxford SGA, called for students to be allowed to submit complaints anonymously during an investigation by the Elections Board and that all complaints become public only after the investigation is complete and a public hearing is held. The bill was tabled, and the legislature will resume its discussion next Monday. Graham said the legislature should codify when the Elections Board should communicate with the community about investigations. Graham also mentioned that he does not support the Wheel’s decision to release information regarding investigations during the past election cycle. The legislature tabled the bill because it was soon going to lose quorum and still needed to vote on two bills as both BBA representatives had to leave for their BBA Council meeting at 8 p.m.
SGA Vice President of Finance Javi Reyes (18B) proposed Bill 51sl66, which approves the administrative budget of $27,458.80 for the 52nd legislature of the SGA. The budget is identical to the one of the 51st student legislature. Graham said he thought it was “weird” that the 51st legislature voted on the 52nd SGA legislature’s budget, but Reyes said the procedure was part of the Finance Code. William Palmer said it was a “safeguard” so that the 52nd legislature doesn’t vote on their own budget. The bill passed with nine voting in favor and one abstaining. Oxford SGA Speaker of the Senate Jacob Hicks (18Ox, 20C), who was acting as a proxy, abstained from voting. Reyes also proposed Bill 51sl66, which approves the 2018-2019 EA budget. There was no discussion around the bill. The bill was passed with nine votes in favor and Hicks abstaining. The Wheel emailed Reyes to ask for the EA’s budgets, and Reyes responded by stating that EA budgets are “not usually publicized as per the Finance Code.” Reyes did not respond to a follow-up email from the Wheel inquiring as to what section of the SGA Finance Code prohibits the publication of EA budgets.